Houston City Dance is proud to host: Calliope, the first full-length work by choreographer Stephanie Sermas, celebrating the life and career of Calliope Charisse, the Maria Von Trapp of dance, a Greek immigrant and student of Isadora Duncan, who has had a lasting influence on dance in Hollywood and on Broadway. Performances: March 24, 2018 at 7:30 p.m. and March 25, 2018 at 2:30 p.m. Tickets: $25. The story of Calliope Charisse and her children could easily be a story in the headlines today: an immigrant family almost turned away from this country whose members go on to make an immeasurable contribution to the artistic heritage of America; a single mom of eleven children, who turns what some might consider a liability into an asset to herself, her children, and America. Calliope was originally from Greece, but moved to Paris with her husband and raised her 11 children there. While in Paris, she studied dance with modern dance trailblazer Isadora Duncan. Left a single mother with no means of support for her family when her husband died, Calliope taught dance and formed a family dance troop that toured Europe and was eventually invited to the U.S. Initially detained upon arrival because the U.S. had already exceeded its quota of Greek immigrants for the year, Calliope and her children were released when the press reported that the family was supposed to be the opening act for famed Russian ballerina Anna Pavlova at the Hippodrome in New York City. After that first performance, the family joined the vaudeville circuit for many years. When the troop’s traveling days were over, many of Calliope’s children went on to continue Calliope’s dance legacy. Among them, her son Nico, husband to famous actress Cyd Charisse, taught ballet to Hollywood stars, and her daughter Nenette taught dance to Broadway greats, creating a legacy still evident today. Of Greek heritage herself, choreographer Stephanie Sermas was made aware of Calliope’s story when an elderly relative in Mississippi forwarded her a five-part series about Calliope that had run in The National Herald, a Greek American newspaper. Once she had read the series, Sermas was drawn to the story of Calliope and wanted to tell it in Sermas’s and Calliope’s preferred medium: dance. Single mom, unwanted immigrant who made good, dancer, all of these aspects of Calliope made Sermas want to tell her story, and she does it in the range of dance that reflects Calliope’s training and legacy and highlights the diverse talents of Houston City Dance Company. Tickets are $25. They can be purchased in advance online at www.houstoncitydance.com/tickets/ or bought at the performance at City Dance Studio, 1307 West Clay, Houston, Texas 77019. 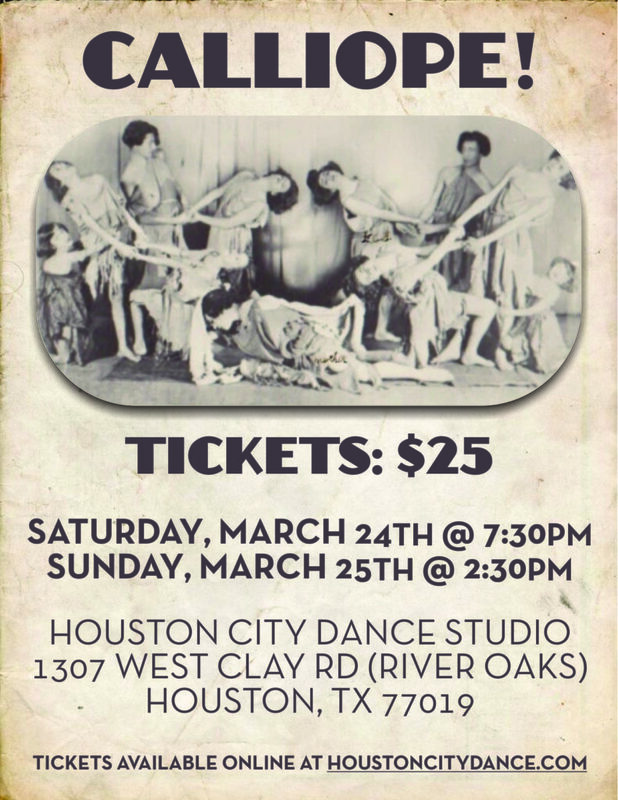 For more information about the concert or the jazz, modern, ballet, and tap classes offered at City Dance, call 713-529-6100 or visit their website at www.houstoncitydance.com. City Dance is a non-profit dance studio and performing arts organization catering to dancers from ages 3 to 83.